Is It Stress, or Alzheimer’s? 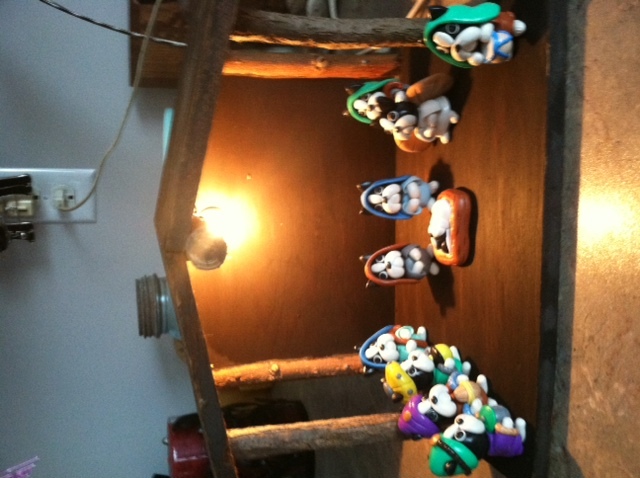 The Nativity as seen through the eyes of Boston Terriers. December is the busiest month of the year for most women, and almost most men. The approaching holidays take their toll on us whether we celebrate them or not. Just knowing that there is an expectation increases our sense of obligation. Should I put up a tree? Do my casual acquaintances really need a gift from me? What about sending Christmas cards? The meal? Ham or turkey? Parties? Special outfits? Last week, the physical proof of the sequel to Pam of Babylon arrived. I was so excited! I went over with it fine toothed comb and found a few minor mistakes, included ‘damn’ where ‘dam’ should have been. I called my publisher and we rejoiced!!! The book would be corrected and go to the printer. And then thankfully, for some reason I read it again. Several major, glaring editing snafus slapped me in the face. There is a major contradiction that my editor missed and so did I, and four repetitive descriptions that just couldn’t be ignored. It was like a repeat of Pam in which there were four puking scenes in the original manuscript. I didn’t want it to be the book about women who threw up, so I had to get rid of three of them. History had repeated itself. After several more readings, I was able to make the corrections without too much rewriting. Tomorrow it goes back to the publisher. Ugh. Monday night I flew into Philly to spend a few days with Jeni and Carlos and the baby. It was wonderful; I took my shoes off by the front door when I arrived and when we went to leave for the airport this morning two days later they were still there. I spent that time in repose, being catered to by my daughter with three home-cooked meals a day, ice water and coffee at my fingertips, and stimulating conversation. All while a four month old, happy, cooing baby sat on my lap. I don’t like to fly, but because I didn’t have much time and it was sort of spur of the moment, I got on a plane. Now next Monday, I am doing it all over again, but in the opposite direction. Andy is actually in Austin, Texas right now, scouting sets for their next movie, but he is supposed to be back over the weekend. So I am going to go see my aunt and the rest of my dad’s relatives and hopefully have lunch with my son. I’ll be gone just a few days. During this time, Jim has a birthday, we have our forty-third wedding anniversary, and then the Christian holidays. I slipped up today while I was being goosed by the TSA agent by wishing her a Merry Christmas. “And I want you to get one, too.” Evidently, her nursing assessment of me left her with cause for concern. So I told her I would get one. “If its positive, you can start taking Aricept now,” she said. Its a drug for Alzheimer’s. Jim and I talked about it on the way home from the airport tonight. He thinks the months of change in our life may account for some of the symptoms Jeni sees in me. I’m not so sure. I keep thinking about that book of mine that I have read at least fifty times and the critical mistake I missed again and again. My sister and I talk hourly about pour-over wills and trusts, things we have to do to make preparation for our death. I think of the diaries and journals I have laying around here. Do I really want my kids to read that stuff after I go? I need to go through my drawers and throw away any ratty underpants so that someday, my son and his wife don’t have to do it for me. (I may have watched too many episodes of Hoarders.) Tonight I will lay in bed and think about Jim and I growing old together. I told my kids once when we all lived in New Jersey and it didn’t look like any of us would ever leave, that when we got old, they didn’t have to visit us. “Just drive by slowly and throw a bag of groceries out for us once in a while. We’ll crawl out to the road and drag it in,” I said. Suddenly, that isn’t so funny any more. Jim and I don’t fly together because if anything happens, our dogs won’t be left alone. Our kids aren’t here to check in on us. I told my daughter today that even when Jim and I drive together in the car, I like someone to know that the dogs are in the house alone, so they won’t cannibalize themselves if we got killed. She looked at me with that look. This entry was posted in Aging, Christmas, Death and Dying, Family Life and tagged Aging, Alzheimer's, children, Christmas, Family Life, marriage, Mental Retardation, Travel, TSA by Suzanne Jenkins. Bookmark the permalink. Oh my god Suzie – we think alike 🙂 I always tell my sister that if I die please go to my house and remove the things I would not want my parents or children to see. ha! I agree with your friend. Ernie is waiting for me to die. He plots my death every day, laying behind me, waiting for me to fall back and crack my head open on the radiator. Suzie – I think my Bostons are waiting for us to die. They secretly want the house to themselves. I can’t imagine what they want to do that they can’t do now, while we are still alive. I doubt that they have read “Animal Farm” – perhaps I should include it in their Christmas Stockings. Merry Christmas and Happy Everything Else.